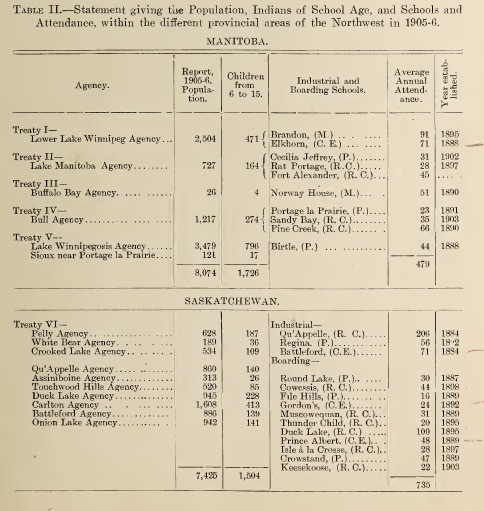 Source: Bryce, Peter H. “Report on the Indian Residential Schools of Manitoba and the North-West Territories” Ottawa: 1907. Department of Indian Affairs, Ottawa, June 19, 1907. Frank Pedley, Esq., Deputy Supt. General of Indian Affairs, Ottawa. Sir, — I have the honour to submit my report on the Indian schools of Manitoba and the Northwest Territories. P. H. BRYCE, Chief Medical Officer. The story of the early explorations and of the trading adventures of the French and English on the plains of the great Northwest has ever been one of exceeding interest to the people of Canada; but while filled with romance and important as illustrating how the great domain has gradually been brought under the dominion of the British Crown, it nevertheless is largely lacking as a record of the more silent, yet more potent, influences which for over a century have been at work transforming the Indian aborigines into members of a civilized society and loyal subjects of the King. Restrained through diplomacy, force and the interests of trade by the great fur-trading companies, the widely distributed and wandering bands of Indians would still have been savages, had it ‘not been for the heroic devotion of those missionaries who, attaching themselves to some band, moved with it in its wanderings, or travelled from post to post where the Indians were assembled while bartering their furs. I Southeastern Manitoba Augusts, 1871. II Lake Manitoba ( south ) August 21, 1871 . III Northwest Angle Octobers, 1873. IV Qu’Appelle District September^, 1874. V Lake Winnipeg September 24, 1875. VI Fort Pitt September 9, 1876. VII Blackfoot District September 22, 1877. 1st. That sufficient land be reserved to give 160 acres to each family of 5. 2nd. For prohibiting the sale of intoxicants. 3rd. A present of three dollars per capita to the Indians on the reserve. 4th. That schools would be provided for the Indians. 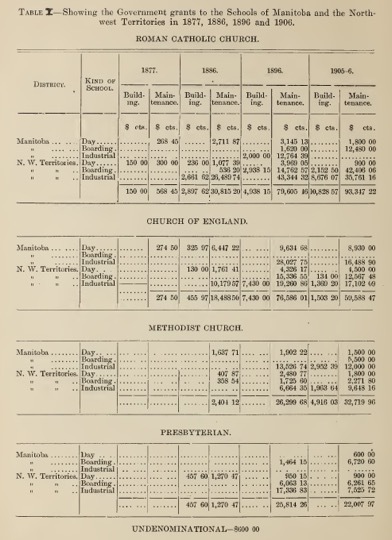 At Confederation in 1867 it was agreed that the Indian Department should contribute an amount equal to that contributed by the Methodist Church for schools in Ontario and Quebec, provided the sum did not exceed $1,000. Hence it was natural and easy, apart from treaty engagements, for the government to extend this principle to the schools of the newly acquired Northwest Territories. There appears a memorandum, of Sir John A. Macdonald, dated October 19, 1880, fixing the salary of $300 to be given each day school teacher in Manitoba and the Territories. It also states that if the attendance should fall short of 25 in any quarter, the teacher should be paid at a per capita rate of $3 per quarter; in the case of non-denominational schools, it was considered that teachers should be paid a maximum salary of $504, or at the rate of $12 per annum for 42 pupils; if the attendance be short of this number, the teacher should receive $3 per pupil for the quarter. The same memorandum provided prizes or bonuses to the teachers of the five best conducted schools in Manitoba and the North-west. The total amount paid by the government as salaries to teachers that year in these 31 schools was $3,227.50, or roughly, $100 per school. In the same appendix may be found items for building materials and for erecting buildings at several points. These quotations serve very well to indicate the embryonic condition of the Indian school system, if it may be so called, in the Northwest, and regarding which the adoption in 1884 of the industrial school idea seems to have been a necessary growth. 1st. Wherever the missionaries have schools, those schools should be utilized by the government if possible; that is to say, a contract should be made with the religious body controlling the school to board, educate and train industrially a certain number of pupils. 2nd. Not more than four industrial schools should be established at first. 3rd. That one be established at the junction of the north and south Saskatchewan near Prince Albert, under the Episcopal Church. 4th. Advises one near Old Fort Bow, near the Stonies and Blackfeet. 5th. Advises that there be one at Qu’Appelle under the Konian Catholic Church. 6th. Advises that there be one established on Hiding Mountain, under the Presbyterian Church. The report formed the basis, apparently, of the action taken subsequently in 1883, when a grant of $44,000 was made by parliament to establish three industrial schools. 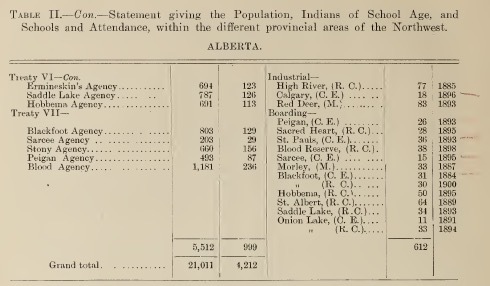 In the annual report of 1881, Commissioner Dewdney states that he hopes to have selections made of localities for the three proposed industrial schools. 1st. That the Government buildings at Battleford be at once utilized for the purpose of a Protestant institution, and that the Rev. T. Clark be appointed principal at a salary of $1,200. 2nd. That the staff consist of an assistant to the principal, a matron, a farmer and a cook, and that the assistant be a layman. 3rd. That the Commissioner determine whether the pupils be taken from one tribe, or independently from all the bands in a given area. 4th. That the Commissioner be charged with the duty of seeing that the buildings are fitted up. 5th. The minister recommends that a Roman Catholic industrial school at or near Qu’Appelle be established with the same staff as at Battleford, and that the selection of the principal be left with the Archbishop of St. Boniface. 6th. The minister also recommends that a Roman Catholic industrial school be established at some point in Treaty 7, and that the selection of the principal be left to the Bishop of St. Albert. 7th. That the Commissioner’s attention be especially drawn to the confidential report of Mr. M. F. Davin on the subject. 1. ‘The buildings are to be kept in repair jointly by the government and the man-agreement, the former to furnish the material and the latter to perform the labour. 2. ‘All books and appliances, that is, maps, globes, &c., for educational purposes, to be furnished by the government. (3) ‘All charges for maintenance, salaries and expenses to be paid by the management, out of the per capita grant. (4) The management not in any event to charge children or their parents for being allowed to attend such institutions. (6) ‘For this consideration the management shall agree to conform to the rules of the Indian Department, as laid down from time to time, and to keep the schools at a certain standard of instruction, dietary and domestic comfort, and that the inspectors and officers of the Indian Department may at any time inspect and report upon the institutions. (8) ‘The minister deems it desirable to put this system into operation after a reasonable time is given to the Church authorities, and he recommends that the first of July, 1898, be fixed as the date upon which the per capita allowances shall commence to be payable. 1. That account books, stationery and an allowance for postage will be given those institutions. 2. That strict accounts of all expenditure incurred on behalf of each school, supported by vouchers, will be required by the department to be kept in each institution, and at the expiration of each year, a revision of the rate of capitation may be made should it appear that such a step is considered necessary. 3. In the event of pupils over and above the number already authorized and estimated for on the capitation system, being admitted into a school, and for whom no provision has been made, beds for occupation by such additional pupils are to be given by the department, if they cannot be made in the institution. 4. In the event of the erection of new buildings at the expense of the department becoming necessary, the cost of the heating apparatus to be included in such cost. 5. Agricultural and other implements, when considered by the department as being unfit for further use, may be disposed of by the officers of the institution in such manner as may be thought proper by them. 6. The department will agree to provide sufiicient grazing land for use of each institution. 7. The department agrees to provide sufficient fencing material for the first inclosure [sic] required, but the fences must be renewed at the expense of the institution. 8. Medical attendance as directed by the commissioner for the pupils of each institution will be provided and paid for by the department. 9. An advance of a sum to be agreed upon will, until further advice, be made by the department to each institution at the commencement of each quarter, to admit of the current expenses of that quarter being defrayed. Such then was the beginning of what may be called secondary school education amongst the Indians of the Northwest, and this, as will be noticed, was coincident with the construction of the Canadian Pacific railway, which was completed across the prairie and which event the commissioner states would facilitate the movement of pupils and supplies. 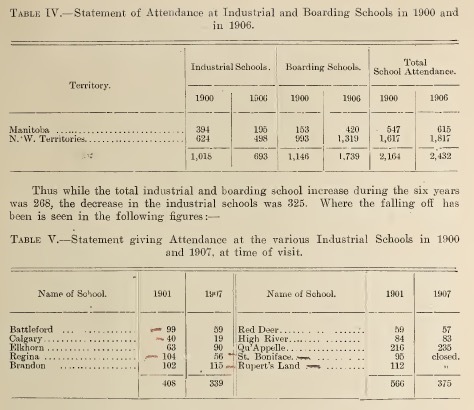 The total number in attendance at the industrial and boarding schools visited by me is thus seen to have been 1,826 in 1905-6; while the actual number of those present in all these in 1905-6 was 1,999. 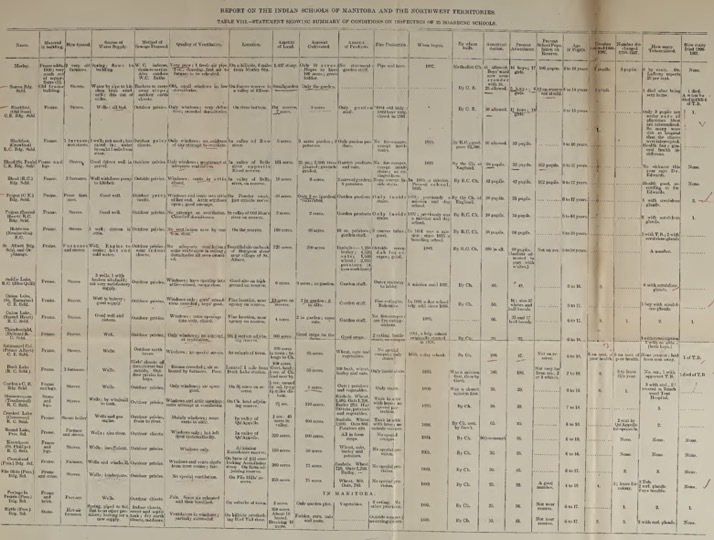 This with the total number, 694, registered at the 74 day schools in 1905-6, gives the total school attendance in schools of every class as 2,691. While the legal school age for admission is from 7 to 16 years, yet children are admitted at 6 years, and are regularly graduated from the industrial and boarding schools at 18 years, but the number of persons between the ages of 7 to 17 inclusive in an average population of 21,011 would be about 5,160, so that taking the average attendance in all schools as 2,691, this amounts to but 52 per cent of the Indian pupils of the ages between which children actually attend school. Reverting to the boarding and industrial school attendance, it is found that a remarkable change has taken place in the relative numbers, during the past six years. 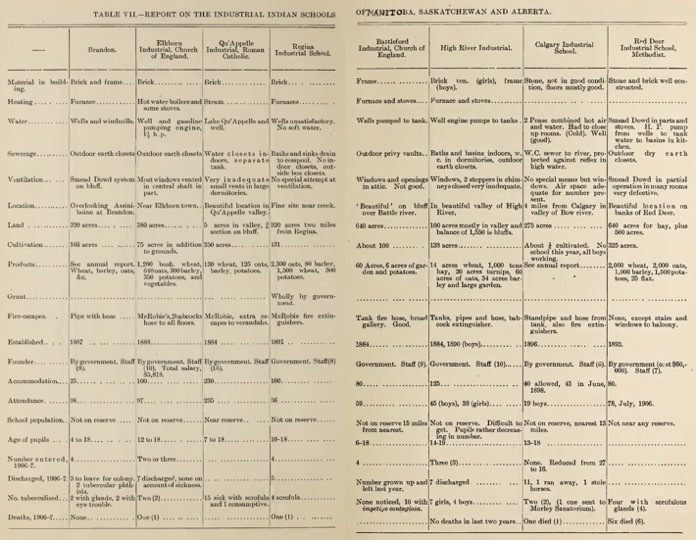 The industrial schools now in operation, the details of the inspection of which will be found in table VII., appended to this report, are eight in number, and, as has been already pointed out, have been carried on, some of them since 1884 at the cost of the government, and with a large aggregate annual expenditure. The total amount expended upon those in operation was $134,635.98 in 1905-6. The original idea seems to have been to have them fairly convenient to the railway, and yet at points about which there would be a group of reserves, and from which their pupils were to be drawn. 1. The distance of the schools from the reserves. 2. The ineffectiveness of the staff in several instances. 3. The lack in practical success of the pupils after graduation. 4. The dependence of the number of pupils upon the co-operation of the staff’s of the boarding schools and upon the canvassing activity of the principals of the industrial schools. 5. The lack of interest of Indian agents in schools at great distances from their particular reserves. 6. The dislike of the parents to have their children so far from home. 7. The great increase and enlargement of the boarding schools on or near the reserves. With, perhaps, the exception of that of Brandon school, every principal expressed the same opinion regarding the difficulty of obtaining and retaining pupils, and all seem to feel that the obligation, in practice if not in theory, which is placed upon them of gathering pupils is not only disagreeable, but is further one which takes them from their proper duties as administrators of the school. However much force there may be in this contention, the fact yet remains that it is only in four instances, those of Qu’Appelle, High River, and Brandon and Elkhorn, that the schools as regards either numbers or effectiveness can be said to have held their own, and that it is only in those that efficient staffs, energetic principals and good discipline are to be found. When so remarkable and successful a principal as Rev. Father Naessens, of High River, has to say that he finds it difficult to maintain the number of his pupils, although situated within the area whence he can draw from three of the largest reserves, the Blackfeet, Bloods and Peigans, on all of which there are Roman Catholic boarding schools, and when he says he is now convinced that his school in order to do the best for his pupils, ought, contrary to his former view, to be situated on or adjoining some reserve, it seems evident that with boarding schools increasing in numbers and in efficiency, the successful continuation of the industrial schools under the present form must become increasingly difficult and expensive. 1. Their location on, or in immediate proximity to, some Indian reserve. 2. That with a few exceptions they have attached to them considerable tracts of land, and are engaged in some instances even more successfully than the industrial schools in agricultural operations and practical outdoor work. 3. That their principals or some members of their establishment, being usually missionaries, are more or less constantly and closely in touch with the parents, whose children are to keep up the supply of pupils, and who, if they be of the right spirit, are constantly cultivating an interest in and sympathy for the school amongst the members of the band, such as is impossible for the principals of industrial schools unassociated with the reserves and long distances from them. 4. The influence of a good master and spiritual adviser follows him, the pupil, to the reserve, where he is encouraged and directed in establishing himself in his future occupation on the reserve. 5. The usually smaller schools, less complex in their organization, possess more of the elements of the family life of a home, and necessarily the influence of the principal, matron and staff is greater in the degree that their personality enters into the life of the pupil. When we know that it is only within the last ten years that what is known as the ‘medical inspection of schools’ has been undertaken in the largest urban populations of this continent, it might be said that it is not to be wondered at that in our Indian schools but little of this work could hitherto have been expected. But the circumstances in the two cases are quite different. In the public school everywhere the child returns to its parents at night and they are naturally chiefly responsible for its health. On the other hand; our industrial and boarding schools have been for the full term of residence in them the home of the child and for his health the staff of the school is immediately responsible. Not only so, but this fact has been recognized by the government, which has for many years appointed and paid medical officers for supervising the health of the children. Nevertheless, it was natural, under what may be termed the accidental circumstances under which, especially the day and boarding schools were begun, and owing to the lack of any system under which they came under government inspection that those teachers accustomed daily to mingling with the Indians in camp would not exercise any fine discrimination as to the degree of health of those admitted to the school. When in addition, in almost every instance, it was found difficult to maintain the school attendance up to the number allowed upon which the per capita payment was made, it is not surprising that cases of scrofula and other forms of constitutional disease were admitted into the schools. Such cases, under the defective sanitary condition of many schools, especially tubercular, has spread, whether through direct infection from person to person or indirectly through the infected dust of floors, school-rooms and dormitories. That the actual situation has not been fully realized, either by the staffs of the schools or by the medical officers except in a few instances is shown by the reports received from month to month and year to year by the department. This fact was fully borne out by my own experience during the recent inspection. Principals and teachers and even physicians were at times inclined to question or minimize the dangers of infection from scrofulous or consumptive pupils and nothing less than peremptory instructions as to how to deal with cases of disease existing in the schools will eliminate this ever-present danger of infection. One of my special instructions was to obtain a statistical statement of the past history and present condition of the health of the children who have been pupils at the different schools. A list of questions was, therefore, left with each principal, requiring that they be answered and sent directly to my address in Ottawa. It is to be regretted that more have not, up to date, been received, but the following table from fifteen schools supplies much valuable information and food for thought. Allowing for the defective way in which the returns have been made, some returning the present condition of all pupils in school and of all discharged as far as ascertained, while others have returned only the status of ex-pupils, it appears that of 1,537 pupils returned from 15 schools which have been in operation on an average of fourteen years, 7 per cent are sick or in poor health and 24 per cent are reported dead. But a close analysis of some of the returns reveals an intimate relationship between the health of the pupils while in the school and that of their early death subsequent to discharge. Thus, of a total of 31 discharged from the File Hills school, 9 died at the school, of 6 others there is no record of condition on discharge, but all are reported to be dead, 7 others died from within a few months to three years after discharge and 9 are reported as in good health, 7 being farmers or their wives at the File Hills Colony, 1 a student, and 1 at Coté reserve. It is most interesting to note that but 7 have been discharged during the past 5 years and that of these 5 are File Hills Colony farmers, and 2 are dead. In every instance where the cause of the 21 deaths was known, it is given as consumption or tuberculosis. I have referred in detail to this school because of the definiteness of statement made, giving an accurate picture of a school probably no worse than many others, and within the last 5 years, under its present management, notably better than many others. Changes in the principal and staff of a school and lack of interest in discharged pupils make many school records defective, and nothing less than a carefully carried out correspondence could give us absolute data regarding all the discharged pupils of the schools. It suffices for us to know, however, that of a total of 1,537 pipils reported upon nearly 25 per cent are dead, of one school with an absolutely accurate statement, 69 per cent of ex-pupils are dead, and that everywhere the almost invariable cause of death given is tuberculosis. Wherever an answer is given as ‘good’; so that we have during a fifteen year period of school history, a study full of information from the medical standpoint. A reference to the details contained in tables VII and VIII, shows that with but two or three exceptions no serious attempt at the ventilation of dormitories or school-rooms has hitherto been made; that the air-space of both is, in the absence of regular and sufficient ventilation, extremely inadequate; that for at least 7 months in the long winter of the west, double sashes are on the windows in order to save fuel and maintain warmth and that for some 10 continuous hours children are confined in dormitories, the air of which, if pure to start with, has within 15 minutes become polluted, so as to be capable of detection by ordinary chemical tests. It is apparent that general ill health from the continued inspiration of an air of increasing foulness is inevitable; but when sometimes consumptive pupils and, very frequently, others with discharging scrofulous glands, are present to add an infective quality to the atmosphere, we have created a situation so dangerous to health that I was often surprised that the results were not even worse than they have been shown statistically to be. On the other hand, there were two or three instances where the knowledge that fresh air or oxygen is life has been positively realized, and where fresh air is allowed to so pour into the dormitories that the air breathed is that of the outer atmosphere. One principal in an otherwise indifferent old school building said: ‘The medical officer has not been here for eighteen months, for no one has been sick, for when the wind is in the east we open the west windows and when int he west we open the east and leave them open all night.’ But, however far one particularly clear-headed many may push this modern gospel of fresh air, it is apparent that it is everywhere the old-fashioned buildings, their very varied and imperfect methods of heating and an almost complete lack of a knowledge of the meaning of ventilation and of methods for accomplishing it in the different schools, that are responsible for this most serious condition which has been demonstrated and which demands an immediate remedy. What further was very noticeable was the almost complete absence of any drill or manual exercises amongst the boys or calisthenics or breathing exercises amongst the girls. One would suppose that in boarding schools the need for such exercises would be looked upon as an elementary necessity; but it was found that it was only in some isolated cases that it had every been heard of or put into practice. And yet the disciplinary value of such exercises, apart wholly from their health value, is so obvious that one was not surprised at the remark of that remarkable woman the Mother Superior of the St. Albert Orphanage, who said that the musical tambourine drill (which I had the pleasure of witnessing) was the first means she had discovered of making the Indian children stand erect and raise their eyes. Perhaps however, remembering the very varied types of teachers, the difficulty often experienced in obtaining permanent ones of high quality, and the sources from which they are drawn, it may be expecting too much to suppose that so elementary a necessity of school hygiene as physical exercises should have been a regular part of the course in these schools. Document 1: Bryce, Report on the Indian Residential Schools (1907) by Sean Kheraj and Tom Peace is licensed under a Creative Commons Attribution-NonCommercial-ShareAlike 4.0 International License, except where otherwise noted.